Entrance to "Loca Miraculi | Rooms of Wonder", lower level in the Milwaukee Art Museum. Photo by Jim Wildeman. Recently, I’ve noticed that several museums have created their own versions of the wunderkammer, or cabinet of curiosities. The Walker Art Center, for example, has arranged their permanent collection into an exhibition called Midnight Party. This new installation, on view until February 2014, is inspired by Joseph Cornell’s film by the same title, and explores works dealing with dreams and fantasies. It also has a gallery dedicated to odd objects, such as a toothbrush that has teeth in the place of bristles. The Brooklyn Public Library just closed their own wunderkammer, which was composed of artworks from Takeshi Yamada’s Museum of World Wonders. The objects reminded one of curiosities seen in carnivals, such as carnivorous plants and a hairy trout. At this point you might be asking yourself, what exactly is a cabinet of curiosities? And how does this relate to the Milwaukee Art Museum? Cabinets of curiosity emerged in the 16th century and were in essence the first museums. They were private collections that included both natural and artificial rarities. 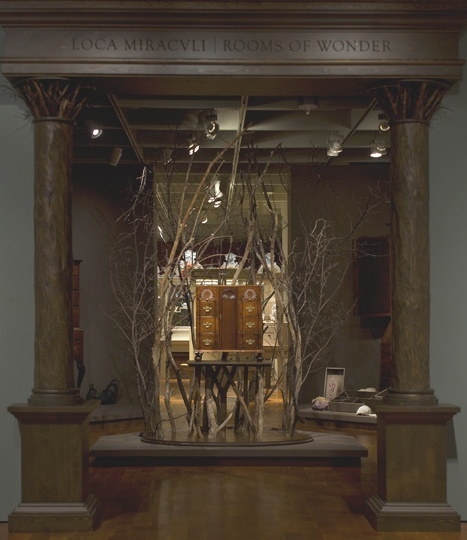 These cabinets were also called wunderkammer, which translates into wonder room. A classic example of a historic wunderkammer is pictured in Ferrante Imperato’s Dell’Historia Naturale, and features a room packed with books, ceramics, taxidermied birds, shells, and even an alligator on the ceiling. These rooms were intended to arouse wonder and interest by displaying the rare and curious. Leaders such as Francesco I di Medici, Frederick III of Denmark and Peter the Great all had their own cabinets. Animal part of "The Three Kingdoms" in the "Rooms of Wonder" installation. Attributed to Christopher Townsend (Newport, RI), High Chest, ca. 1745. Chipstone Foundation, 1985.12. Hermaphrodite deer lent by Eric Ferguson. Photo by Jim Wildeman. When the Chipstone Foundation re-installed the Museum’s lower-level American Collection galleries in 2008, they decided that it was important to once again have museums evoke a sense of wonder. With that in mind, they asked Madison-based artist Martha Glowacki to create an installation. Martha was given free rein of the collection. She could pick and choose objects, as well as combine them in any way that she saw fit. The resulting galleries, aptly titled the Loca Miraculi: Rooms of Wonder, are divided into three sections: the three kingdoms, ceramics and illusions. 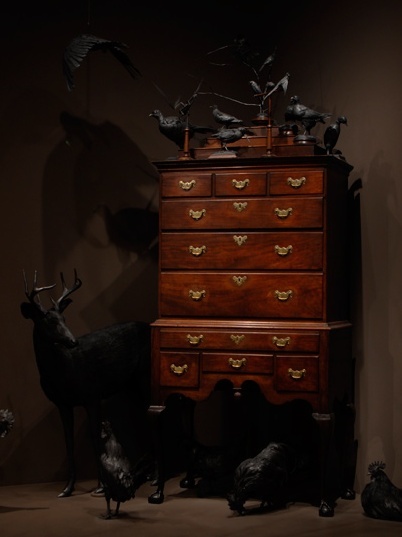 The first gallery combines taxidermy birds and a deer with a ball-and-claw foot chest (pictured at right, showing the allusion to the animal qualities of 18th-century furniture); a spice chest with branches (referencing the material’s origin); and a desk and bookcase filled with rocks and minerals from the University of Wisconsin-Madison’s geology department (this combination of natural and artificial was very common in the first cabinets). 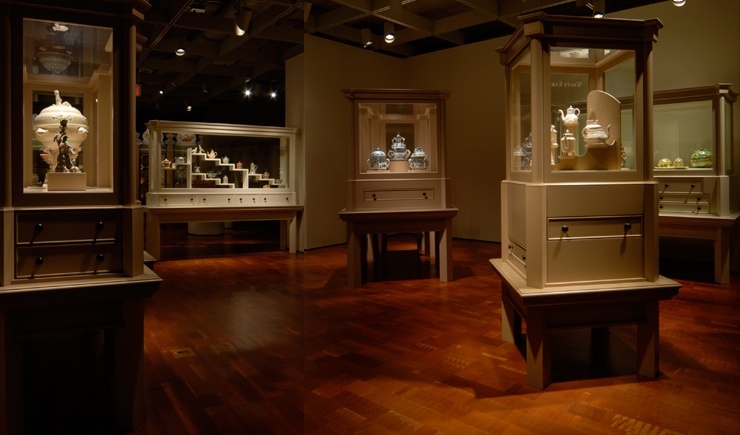 The second room showcases ceramics from the Chipstone Collection, but instead of labels describing each object, there are drawers underneath the objects, which the visitor is encouraged to open. These drawers contain drawings, videos, fossils and other objects that help us understand the ceramics’ form and design. View of "Ceramica" in Rooms of Wonder. Photo by Jim Wildeman. The third gallery contains visual illusions; games that were popular and included in some of the historic wunderkammer. The rooms encourage the visitors to make new connections between objects, while preserving the sense of wonder and mystery that was integral to the first museums. Martha Glowacki is currently in another cabinet of curiosities exhibition at the Peck School of the Arts Inova Gallery. We invite you to go see her work and then stop in the Milwaukee Art Museum’s Rooms of Wonder to lose yourselves in a world of curious fascination. Remember to open the drawers! This entry was posted in Art, Curatorial and tagged Art Installation, Chipstone Foundation, Martha Glowacki, Rooms of Wonder. Bookmark the permalink. I just saw Martha Glowacki’s installation at Inova a few weeks ago and it is incredible! Absolutely beautiful. If you like the Rooms of Wonder even just a little bit, Inova is definitely worth a visit before the show closes on September 18.